Roku is a mighty streaming video machine, with channels offering movies and shows from most major streaming providers, including Netflix, Amazon Instant Video and HBO Go. Many users want to use Roku as a streamer to cast local video contents to HDTV for playing, but they don’t know which format is supported for streaming, that’s why we are here to learn how to stream any Supported/Unsupported Video and Audio format from your mobile to Roku. Only supported file types are shown in the Roku Media Player channel. The channel hides unsupported file types. Dolby Digital audio in MKV and MP4 movies is only supported via pass through. Video format: DRM-protected content, common videos like 3GP, VOB, MTS, AVI, M4V, WMV, XviD, DV, MP4-XviD, DIVX, H.264, H.265 (HEVC), MP4-MC, OGV, ASF, MPEG-1 NTSC, MPEG-1 PAL, MPEG-1 SECAM, MPEG-2 NTSC, MPEG-2 PAL, MPEG-2 SECAM, DVD-Video NTSC, DVD-Video PAL, DVD-Video SECAM, FLV, F4V, SWF, 3GP, 3G2, etc. Audio format: AC3, M4A, OGG, AIFF, AU, MKA, APE, M4B, M4R, etc. 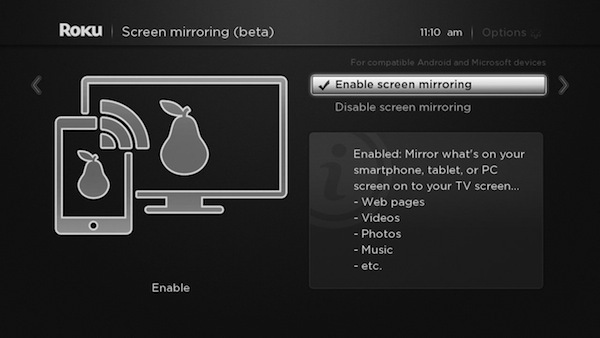 Note: Though Roku doesn’t support beaming videos from your PC to TV officially, you can find the solution here instead. For iOS and Android phones, Roku has a free app that acts as both a remote control for the set-top box and a slinging tool. 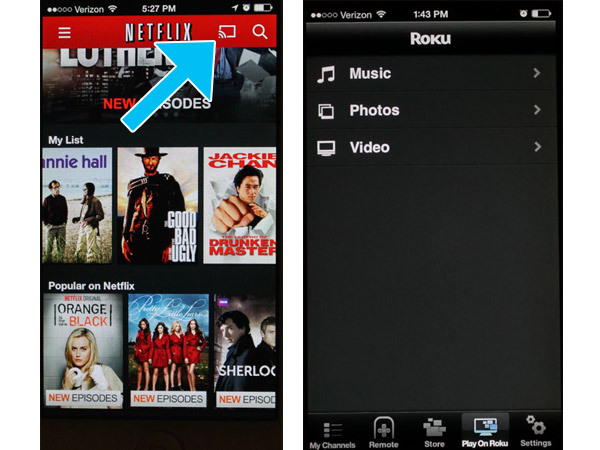 By selecting the top-right-corner menu, you will find a “Play on Roku” option. This allows you to play photos and music–but not video–from your phone on your TV. 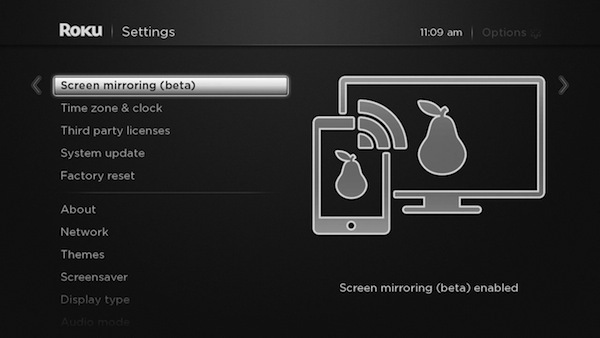 Roku has introduced Miracast/WiDi capabilities as a beta feature with its Roku 3 and Roku Streaming Stick devices. To activate, update either of these devices to software version 5.6.60. Simply access the main menu and select “System Update,” then follow the instructions onscreen. For naturally unsupported formats of Roku, you will need a third-party tool to help you out. Here Pavtube Video Converter Ultimate is your best choice which is capable of converting your media to Roku supported formats like MKV, MP4, MOV, WMV for streaming with no quality loss. And what I’ve learned is that MP4 would be one best target format for it is fully compatible with nearly all media devices including iPad, iPhone, PS3, Apple TV, etc. 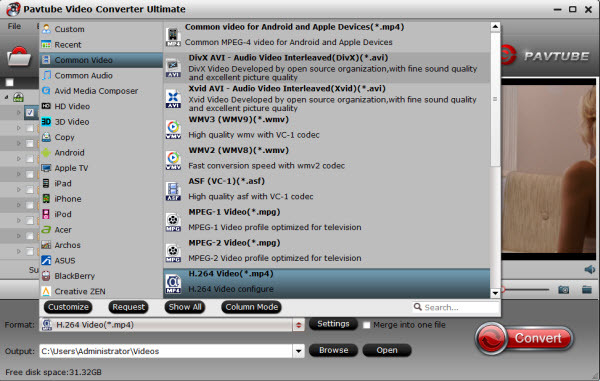 If you are running on Mac OS X, turn to iMedia Converter for Mac. If you haven’t got the software, download it now and let’s start the conversion. Run the Roku Movie Coverter; click the Add button to load movie files to the program from your computer. You can also directly drag the video files into the program. Hit the Format box and choose your desired format. To store your movies on Roku for widely using, you’d better encode them to .mp4, .mov, or .mkv, etc compressed format. Tip: If you like, you can click “Settings” to change the video encoder, resolution, frame rate, etc. as you wish. Keep in mind the file size and video quality is based more on bitrate than resolution which means bitrate higher results in big file size, and lower visible quality loss, and vice versa. Simply click the Convert button to start encoding video to MP4/MKV for Roku. Within several minutes, you can find the converted file on your computer by clicking the “Open” button. Afterwards, it’s free to stream your media files from Roku. Make sure the wireless network connection is accessible among the Roku and iPad, Apple TV, PS3, HD TV or other media players. What’s more, you can also set Plex on Roku for Blu-ray/DVD playback on Roku.